At the recent World Government Summit, Hexayurt Capital and ConsenSys released a paper called “Building the Hyperconnected Future on Blockchains”. The purpose of the paper was to provide an Internet of Agreements (IoA) strategy for the next wave of innovation in order to drive Globalization 2.0. The World Government Summit hosts 3000 world leaders, policy makers and experts from more than 130 countries. Speakers at this summit included Elon Musk (Tesla and Space X), Travis Kalanick (Uber), Reid Hoffman (LinkedIn) and Sheikh Mohammed bin Rashid Al Maktoum (Crown Prince of Dubai and Prime Minister of the United Arab Emirates). Blockchain is an emerging technology that uses a shared ledger for the recording of transactions. Ethereum, one of the more popular blockchains, supports smart contracts which allow for agreements to be represented in code and subsequently executed alongside the blockchain. There are many large organizations backing a new Enterprise Ethereum alliance including Accenture, Banco Santander, JP Morgan Chase, Microsoft and Intel. There are no central clearing houses to move computers closer to. Transactions clear in the same amount of time regardless of where in the world they were issued. This means fair play for everybody regardless of their location. This is achieved by running transactions in small batches called “blocks". A benefit of decentralization is extremely strong cybersecurity. The process which lets many computers all over the world process transactions together also means that if a machine is compromised, it does not affect the rest of the computers holding the blockchain. A blockchain is a secure sequence (“chain”) of blocks. It is operated by a fair consensus (algorithm) which makes all participants equally responsible and equally capable. Local blockchains can be run by a sovereign entity or a company, and they can choose who can participate, similar to an existing corporate network, but more secure. Global blockchains work more like the internet itself: anybody can participate, but without compromising the inherent security of the blockchain. When we created the initial ideas which grew into the Dubai Blockchain Strategy, our intention was to build on the pre-existing strengths of government. Secure record keeping is a core competence of the state. New technology allows government to extend its services in new ways. The original conception inside of Bitcoin and Ethereum (two leading blockchain projects) was that many government-type services could be provided without strong reliance on state support. Peers (service providers) to get a square deal from the Inc in the center. Because the Inc is a company with a few thousand staff, and the Peer is typically an individual with a little sliver of resources to share, in the event of a dispute they are not evenly matched. This pattern replicates between market makers and vendors at all scales. SWIFT and VISA are quite powerful compared to their member banks: being barred from either network would be catastrophic for many financial institutions. Dee Hock, the founder of VISA, tried and failed to build an interbank network before VISA was created because of these commercial dynamics. A collective representation or altered ownership model, or regulation from the government. A future can be envisaged in which peers are formed into collective bargaining blocs a little like labor unions, or a future in which peers own the Inc structure which represents them, or a future in which the government regulates sharing economy companies quite strictly to ensure a fair deal for all. When the cost and complexity of running a sharing economy market for cars, housing or some other resource drops by 90% or 95% because of automated contracting infrastructure on blockchains perhaps the natural economic equilibrium will favor many small actors working together in networks rather than larger single corporate bodies. 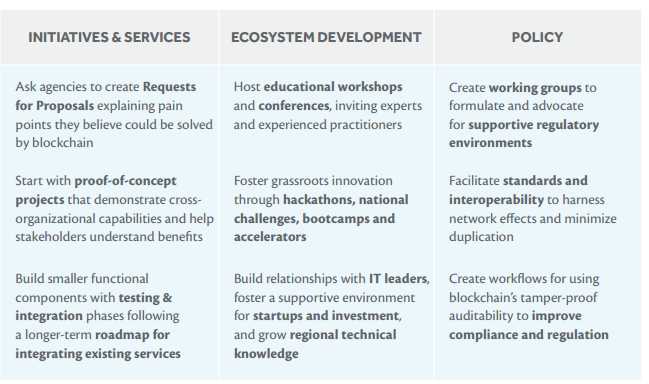 Governments, like any potential blockchain user, should look at the pain points in their business processes and try to re-envision them as processes taking advantage of smart contracts and the blockchain. There should be a place where IT professionals can experiment with the technology, ‘get their hands dirty’, and learn fast. Microsoft has implemented this type of sandbox environment on the Microsoft Azure cloud, where developers can spin up an Ethereum blockchain sandbox in 10 minutes and get to work, and the ecosystem is full of developer tools, platforms and templates to get started with blockchains and smart contracts. In addition to requests for information, hackathons, research challenges and labs are good ways to investigate blockchain technology. As an example, in August 2016, the U.S. Department of Health and Human Services had a “Use of Blockchain in Health IT and Health-related Research Challenge” which received more than 70 submissions. The blockchain ecosystem at present is brimming with new innovations. Some companies are building customized blockchains for enterprise use cases ranging from finance to asset tracking. As custom private implementations may hinder future interoperability, consortiums such as Enterprise Ethereum are being formed to discuss this. There is no standardization in identifying information customers must submit to financial institution and these institutions often duplicate effort in performing Know Your Customer (KYC) checks. This imposes very high transaction costs on both banks and customers without actually adding much security to the global financial system. Digitally signing claims about others, known as attestations, allows for other identities or institutions to verify and attest to the validity of an identity’s profile data. This can be useful for Know Your Customer where a bank can attest to customer data it has verified such as age, address or other attributes. Establish role-specific, actor-agnostic identities (i.e. CTO) with specific permissions. Chinese automotive giant Wanxiang recently invested $30 billion USD in a new smart cities initiative that includes using blockchain technology to essentially securitize the batteries that are used in electric cars. If a car or taxi wanted to go faster than the cars around it, it could pay more and get a faster route, automatically negotiating the economic interaction with the other vehicles around it. For governments, the ability to charge flexibly for road use at certain times or in certain places can reduce congestion or pollution, and encourage optimal use of the available roads. There are many blockchain use cases emerging in energy. Opportunities exist in managing energy credits and reducing the double counting problem wherein: “utilities receive RECs verifying that a local source of power is renewable and then sell these RECs to other utilities. When a renewable electricity generator sells electricity, it sells the juice — then sells the credits separately.” By using blockchain, these energy credits may be exposed in a more transparent manner by recording the transactions on a public ledger. Blockchain also provides many opportunities for emerging Microgrids. The increase in solar power generation and smart meters have created opportunities for consumers to reduce their dependency on large, centralized power generators. The result is consumers can use the blockchain to generate excess energy and exchange their own green energy credits with their neighbors. One such blockchain microgrid project that ConsenSys was involved in is the Brooklyn Microgrid. The average U.S. patient has approximately 19 distinct medical records and in a 2010 survey, reported seeing 18.7 different doctors during their lives. Patients can have their medical information follow them wherever they go rather than being scattered amongst disparate providers and health systems. Authorized medical professionals can retrieve a patient’s relevant medical history at the point of first contact rather than relying on telephone calls and paper files. Improved patient records would allow providers to communicate better care and monitor treatment progress more accurately. The blockchain can be a repository of access-controlled information securely shared across organizations. As a new archetype for Health Information Exchange, all of this data can be made portable for patients in a cryptographically secure way.